Kalamazoo, MI – Pro-life leaders looking into an abortion-related death have confirmed that Cree Erwin, 24, of Battle Creek, Michigan, received an abortion at the Planned Parenthood facility in Kalamazoo on June 30, 2016. The site of her abortion had been previously unidentified. Erwin died on July 3, 2016, just three days after her Planned Parenthood abortion and hours after being seen at a nearby emergency room complaining of abortion complications she was experiencing. Castleman’s Drug Control Location License for the Kalamazoo Planned Parenthood lapsed on January 31, 2016. In Michigan, medical providers must obtain a Drug Control Location License for every facility where they routinely dispense drugs. In addition to her employment with Planned Parenthood, Castleman has served as an abortion training faculty member for the National Abortion Federation, and co-authored an abortion training manual. Castleman is suspected of involvement in at least three other abortion-related injuries in Kalamazoo and Ann Arbor, contributing to a nationwide pattern of abortion injuries and deaths at Planned Parenthood facilities. On September 10, 2015, an ambulance was summoned for a 15-year old abortion patient of the Kalamazoo Planned Parenthood who was struggling to breathe. An abortion worker asked the 911 dispatcher to send the ambulance with no lights or sirens despite the patient’s life-threatening, Priority 1, condition. A complaint has been filed by Operation Rescue against the Kalamazoo Planned Parenthood, seeking a revocation of its facility license that permits it to conduct abortions. Meanwhile, a homicide investigation conducted by the Battle Creek Police Department remains open pending the release of Erwin’s autopsy report, which may not be available for weeks or months. 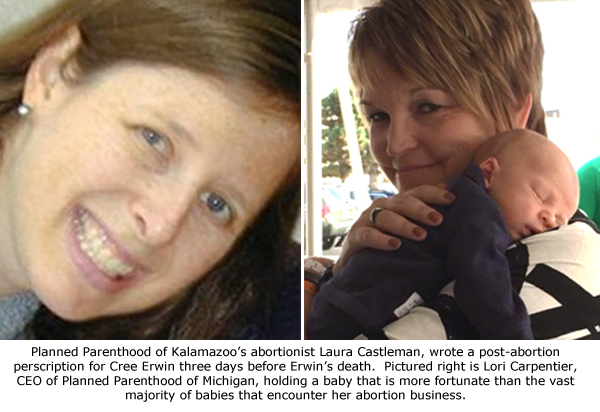 “If Cree Erwin had not visited the Kalamazoo Planned Parenthood for an abortion, she would be alive today. I urge the Michigan Department of Licensing and Regulatory Affairs not to turn a blind eye to the pattern of abuses we are seeing at Planned Parenthood facilities. The Kalamazoo Planned Parenthood is not safe and must be shut down to protect other women from ending up on a slab in the morgue,” said Cheryl Sullenger, Senior Vice President of Operation Rescue. “While we mourn with the family of Cree Erwin, we are compelled to sound the alarm about the growing ranks of women and infants killed, or reproductively maimed in a Planned Parenthood. The number of women leaving a Planned Parenthood in an ambulance amid allegations of harvesting baby body parts reminds us of two things: Planned Parenthood’s population control mission and their unfettered greed. Both must be stopped in their tracks before one more vibrant young woman loses her life,” said Catherine Davis, Founding Core Member for the National Black Pro-Life Coalition. “Planned Parenthood of Kalamazoo, under the leadership of Lori Carpentier, CEO of Planned Parenthood of Michigan, has a history of not functioning within basic medical standards and flying under the radar with the apparent cooperation of the State of Michigan. The Kalamazoo Planned Parenthood continued to operate without a proper facility license from September 2012, until January 2016. How does the State of Michigan let this happen? I’m calling for Carpentier to first make a public apology to the family of Cree Erwin, and then step down from her position. Immediately!” said Lynn Mills of Pro-Life Detroit.